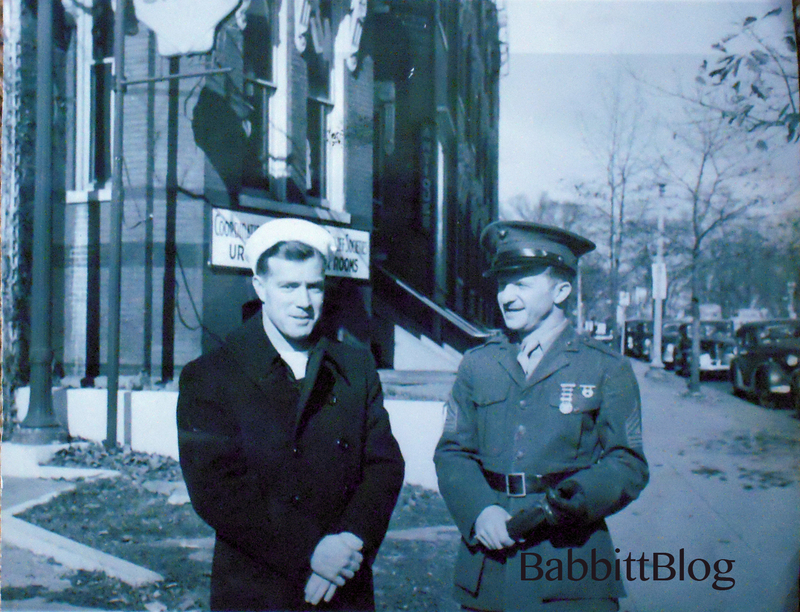 Wishing you a meaningful Veteran’s Day from BabbittBlog. Here is Art Babbitt, WWII veteran and marine, in full stripes and uniform, probably in 1945. Can anyone identify the friend or location? This entry was posted in 1942-1946: Repercussions, WWII and tagged Disney, Goofy, Marines, Military Logo, sergeant, soldier, uniform, Veteran, World War II, WWII. Bookmark the permalink. I don’t know who it is on the left but he appears to be a US Navy sailor. Judging from the sign behind the sailor, I’m guessing they are stateside. The Goofy insignia was created in the fall of 1942 by either Van Kaufman or George Goepper. The design was created for the Advanced Carrier Training Group. The other guy in that photo is George Goepper.